Although highly developed, the North Creek Subarea supports runs of chinook, sockeye, kokanee and coho trout and steelhead trout. As nearly half of the subarea is covered by impervious surfaces (pavement, buildings, etc. ), it is not surprising that altered hydrology and loss of channel complexity are two of the primary concerns for salmon here. There are also fish access and passage barriers in the North Creek Subarea. 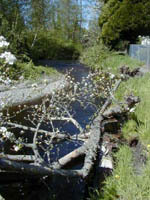 Salmon habitat projects in the North Creek Subarea funded through the WRIA 8 collaborative process are now included in the Habitat Work Schedule (HWS) state-wide website. In the website, click on the WRIA 8 watershed on the state map to enter our HWS website.